Barbara Henry is Associate Professor of Slavic Languages & Literatures at University of Washington. 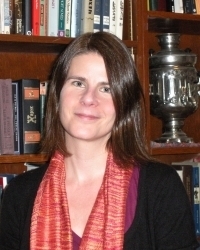 Her research focuses on the history of Yiddish theatre, particularly in Russia. She is the author of Rewriting Russia: Jacob Gordin’s Yiddish Drama (2011) and, along with Joel Berkowitz, co-editor of Inventing the Modern Yiddish Stage: Essays on Drama, Performance, and Show Business (2012). She also serves as copy editor of DYTP’s Blog. The DYTP’s first long form blog post: a reflection on the actor and impresario Avrom Fishzon (1843?–1922). ​Reviews of Avrom Goldfaden’s productions in the Russian empire from 1878 until 1883 are notorious for critics’ snarky pot-shots, huffy asides, and sniffy evaluations.